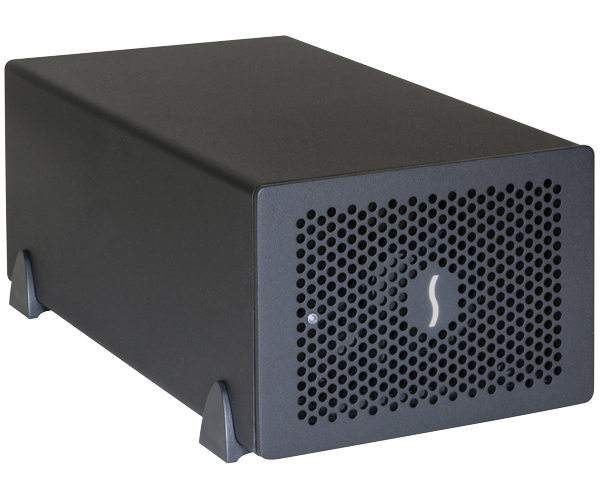 Sonnet's Echo™ Express SE II enables you to connect two high-performance, professional pro video capture and processing, digital audio interface, DSP accelerator, FireWire, RAID controller, 10 Gigabit Ethernet, eSATA, and other PCIe cards to any Mac® or Windows® computer with a Thunderbolt™ port. Accommodating cards up to 7.75 inches long, this compact Thunderbolt 2 to PCIe card expansion system supports nearly every Thunderbolt-compatible PCIe card on the market, including double-width (PCIe card + daughter card) cards. Measuring just 6.5 inches wide by 4.6 inches tall by 11 inches long, the Echo Express SE II takes up little space wherever you work, be it in the studio, on location, at your desk, or in the edit suite. Like all Echo Express systems, the SE II has two Thunderbolt 2 ports that support daisy chaining of up to six devices to a single port on your computer. Additionally, the Echo Express is backward compatible with 10Gbps Thunderbolt technology and upgradeable to Thunderbolt 3.